Our family had a very happy 4th of July weekend in the Smoky Mountains, i.e. the area around Gatlinburg and Pigeon Forge. About fourteen years ago, we spent a chilly Spring Break in the area. This time, we headed back for a short trip to enjoy the area: Mom, Dad, me, and Sissy. Dan had to work at the brewery, so it was just the small group for the voyage. We stayed courtesy of Dad's timeshare points at Wyndham's Great Smokies Lodge, which is part of the Wilderness at the Smokies Waterpark Resort. Our room was amazing! I think the Wilderness rooms have more of a rustic feel, but our Wyndham building definitely had a modern 2BR2BA apartment suite for the four of us. We used the kitchen for breakfast and dinner each day, and the whole place was nicer than where I actually live. I even made my strawberry cake to celebrate Sissy's birthday. We spent some time at the water park on Friday, which has an indoor and outdoor area. 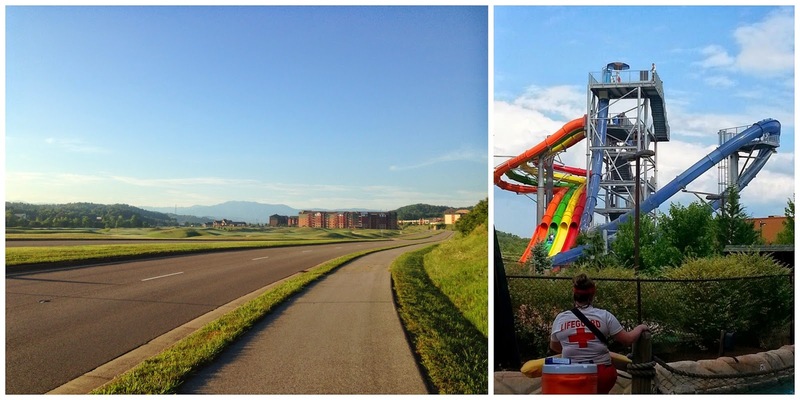 There is one water slide called the Wild Vortex where the floor drops out beneath you for a 39-foot drop... I did it once, and that was enough! Dad went first, so I had to try it after him. We also did the colorful racer tube slides, and Mom joined us for two rounds of the lazy river. I also went running on the property, which was nice. We hit up the outlet malls (great sales at LOFT! ), and even did the hike out to Laurel Falls. 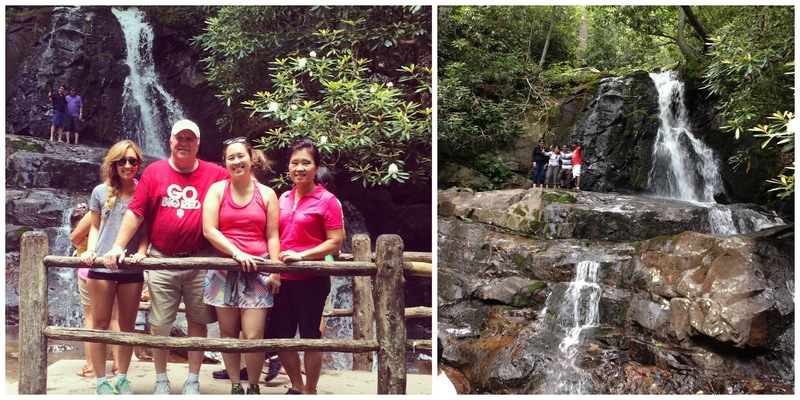 Laurel Falls is a pretty (but hilly) 1.3 mile trek each way, and there were a ton of people. But Mom was determined to do it again after we completed it as a family over a decade ago. I was not thrilled, but it turned out to be quite pretty! Overall, it's was a nice way to spend the weekend with my family, away from home and enjoying a pretty piece of Tennessee. Your photos are beautiful! I've been wanting to go to the Smoky Mountains for a while now. That is such a pretty area. I love going up there. Wyndham has some of the best time share resorts. Bonnet Creek at Disney World is gorgeous too. Thanks! I'd like to go back and visit the Aquarium of the Smokies. Don't let the Ripley's branding fool you, I'm told it's one of the best in the U.S. I believe my parents reserved Bonnet Creek for my Disney Marathon in January! They booked early to encourage me to train and get ready. They will support me... I am thinking of going to Wizarding World of Harry Potter and probably convince them to join me for Epcot and maybe Animal Kingdom. They don't do rides really. Haha! Then EPCOT and Animal Kingdom are perfect for them. :) Plus Bonnet Creek just went through a total rehab that includes new buildings last year.